Anna, you have a huge garden. What are you talking about? Yes, you are right. My garden is a wee bit out of control. (I will never admit this to the hubby as he complains about the constant gardening chores. Shhh. Keep it our secret, okay?) Even with my garden, I still only have limited room for what I want to grow and potatoes take up too much room in my opinion. Just a note, there are other methods to grow potatoes other than potato bags. I just love them. 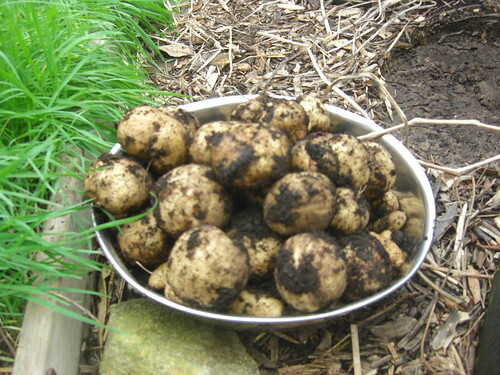 Read Organic Gardening’s “7 Ways to Plant Potatoes” which includes potato bags. In May, after the frost date has passed, I haul out the potato bags from storage. The instruction states to fill them up a third of the way with a mixture of compost and soil. Add a cup of organic fertilizer to the soil. I use Cockadoodle Doo fertilizer. Yes, this is the bonehead thing I forgot for the last three years. And believe me it makes a difference. Think golf balls compared to tennis balls. Then you plant about five of the potato seeds. I buy Yukon organic potato seeds from Gardener’s Supply. However, you can purchase blue or red potatoes too. My kids love Yukon potatoes since they taste so buttery. As the potato vines start to grow, you keep adding the mixture of soil and compost until the soil line reaches the top of the bag. During the season, the vines will flower. The color of the flower depends on the inside color of the potato. So, if you plant blue potatoes, you get magnificent blue flowers . Personally, I wasn’t thrilled with the potatoes but then again, I forgot to add fertilizer. Then you wait. And wait some more. (No peeking.) Then around September, the vines looks scraggly, decrepit, and just plain ugly. Don’t be fooled in August when they start to whither due to the heat. Once it gets cool again, you would think the potato stems had a second life. I usually wait until right before my frost date to start looking for potatoes. How about you? I have to tell you that harvesting potatoes is really fun. Watch the above video. I felt like a kid in a candy shop when I found the potatoes! Down right dirty fun. Your kids or grandkids will love hunting for potatoes. Great school project! Those spuds could be anywhere in that bag. My trick is to empty the dirt into a wheel barrel as I dig for yukon gold. Many times, I discover potatoes that I missed in the wheel barrel. Don’t do what I do. I wash the potatoes and then dry them. Yes, another bonehead move. Just let the dirt harden and then gently wipe off the dirt. The potatoes need time to cure so their skin gets tough. The most important thing you can do when you cure your potatoes is keep them out of the sun. If you don’t, you will have green potatoes and they will taste bitter. The University of Idaho states that if eat green potatoes in great quantity, it can be toxic. I put my potatoes in those open webbed plastic pot trays and cover them. According to the University, an ideal storage temperature for storing potatoes is 45-50 degrees. Inside temperatures tend to be 65 to 75 degrees. If you store your potatoes inside, they will start to sprout at 30-140 days after harvest depending on the type of potato you planted. On the other hand, freezing temperatures will cause the potatoes to turn black or gray. The University tested various storage methods and found that the ideal location for storing potatoes is in a perforated plastic bag in a dark, humid, cool place like a garage, basement or root cellar. Storing them in a refrigerator in which you increase the temperature also works. To create humidity, they also suggested placing a pan of water near the tubers or storing the potatoes in a perforated plastic bag. They warned not to store them in an air tight plastic container. I am probably going to store the potatoes in my refrigerator and increase the temperature. I don’t have anywhere to store them in my garage. (If you have a cabinet in the garage, this would work.) My attic is too cold, and my basement too warm. Remember, I have a really tightly constructed house. Do you plant potatoes? If so, which ones do you grow? Have you used the potato bags? Do you have any gardening bonehead moments to share? Ah, come on. It will be fun. That looks like more fun than an easter egg hunt! I’m trying this method of growing potatoes this year. I only have one bag, but we’ll see what happens! Vickie, it is so much fun to hunt down the potatoes. You are going to love it! red potatos are ready to harvest after 70 days? No one ever seems to address how much to water and how often. How often do you water. Does water run drain out of the bags? I want to grow these. I tried a large trash barrel but did not get much. I can not figure out if I watered too much or too little. Candee, an inch of water per week. You can put a tuna can out to see if you get that much rain fall. The water is wicked away due to the fabric. You may have to water more than you would with a plastic container. Did you put holes in the sides and under the bottom of your trash can? The holes help with drainage and air flow.